1. apparent increase in size, as under the microscope. 2. the process of making something appear larger, as by use of lenses. 3. the ratio of apparent (image) size to real size. 1. The seeming increase in size of an object viewed under the microscope; when noted, this increased size is expressed by a figure preceded by ×, indicating the number of times its diameter is enlarged. 2. The increased amplitude of a tracing, as of a muscular contraction, caused by the use of a lever with a long writing arm, that is, one in which the fulcrum is placed nearer to the muscle than to the writing point. (in psychology) cognitive distortion in which the effects of one's behavior are magnified. See also minimization. Imaging Amplification of an image. See Biologic magnification, Microscopy. 1. The seeming increase in size of an object viewed under the microscope; when written, this increased size is expressed by a figure preceded by ×, indicating the number of times its diameter is enlarged. 2. The increased amplitude of a tracing, as of a muscular contraction, caused by the use of a lever with a long writing arm. 1. An increase in the apparent size of an object. Syn. enlargement. 2. Specification of a magnifying device to form an enlarged image. Syn. angular enlargement. Note: low vision practitioners consider this type of magnification in which no specific distance is specified as a synonym of apparent magnification. Example: a lens of +16.00 D provides, in these conditions, a magnification of 5✕. Syn. iso-accommodative magnification; magnifying power; trade magnification. See iso-accommodative magnification; lateral magnification; equivalent viewing power. axial magnification The ratio of the distance along the optical axis between two points in image space l′ to the distance along the optical axis between the corresponding two points in object space l, i.e. l′/l. The axial magnification is approximately equal to the square of the lateral magnification when the object is far away from the optical system. This magnification is useful when considering an image in its three dimensions. Clinically, it is important when assessing the thickness of a retinal lesion in indirect ophthalmoscopy. Syn. longitudinal magnification. combined magnification The product of the individual values of each type of magnification used in combination with each other. Example: if a patient uses a CCTV monitor to provide a magnification of 5✕ viewed at a distance of 50 cm, and then views the same screen at a distance of 25 cm, thus producing a relative distance magnification of 50/25 = 2✕, the total magnification is 5 ✕ 2 = 10✕. Syn. total magnification. conventional magnification See apparent magnification. cortical magnification Term referring to the fact that the amount of cortical area devoted to processing visual information from the central area of the retina far exceeds the amount devoted to the peripheral retina. It is estimated that about 25% of the cells in the visual cortex are devoted to processing the central 2.5º of the visual field. Syn. magnification factor. See visual area; macular sparing. distance magnification See relative distance magnification. effective magnification See apparent magnification. electronic magnification Magnification obtained using an electronic vision enhancement system (EVES), such as a closed-circuit television (CCTV). It is equal to the ratio of the size of the image on the screen to the size of the original object being viewed. Example: an object 2cm in height measures 6 cm on the screen, the magnification is 6/2 = 3✕. Syn. real image magnification; transverse magnification. magnification factor See cortical magnification. where F is the power of the magnifier (assumed to be so close to the eye as to ignore the distance separating them) and D the object vergence. The special case in which the object distance from the eye is 25 cm (D = 4.00 D) is the trade magnification. See apparent magnification. where l′ and l are the distances of the image and object, respectively from the principal plane of the lens (or lens system) and L and L′ the object and image vergences, respectively. Syn. enlargement ratio (ER); linear magnification; transverse magnification. (Note: some authors consider this last term a synonym of electronic magnification.) See equivalent viewing power. linear magnification See lateral magnification. longitudinal magnification See axial magnification. loupe magnification See apparent magnification. nominal magnification See apparent magnification. real image magnification See electronic magnification. relative magnification See apparent magnification. = x/x′where x and x′ are the initial distance and the new distance, respectively. Example: if the viewing distance is decreased from 60 cm to 20 cm, Md = 60/20 = 3✕. Syn. distance magnification; relative distance enlargement. = h2/h1where h2 and h1 are the sizes of the enlarged object and the initial object, respectively. Syn. size magnification; relative size enlargement. relative spectacle magnification (RSM) The ratio of the retinal image size in the corrected ametropic eye to that in a standard emmetropic eye. See Knapp's law. shape magnification Magnification resulting from a variation in the curvature of the front surface and thickness of an ophthalmic lens. In the treatment of aniseikonia it may be necessary to alter the magnification of a lens while leaving its dioptric power unchanged. Syn. shape factor. See aniseikonic lens; spectacle magnification. size magnification See relative size magnification. where F1 is the power of the front surface, F′v the back vertex power of the lens, t its thickness, n the index of refraction and d the distance from the back surface of the lens to the entrance pupil of the eye. The first term in the formula represents the shape factor (shape magnification) and the second term the power factor (power magnification). However, since the shape factor is very small for most common ophthalmic lenses (except for high plus lenses), it is often ignored in the above formula. 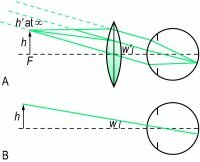 where α′ and α are the angles subtended at the eye by the image viewed through the telescope and the angle subtended at the eye by the object, respectively and Fe and Fo are the powers of the eyepiece and objective, respectively. Telescopes are used to magnify objects at distance (afocal) and placed over the spectacle correction. If the patient is uncorrected the telescope can be adjusted but the magnification will change. They can be used for near and intermediate viewing by altering the distance between the objective and the eyepiece, or adding a plus lens in front of the objective, the result being a combined magnification (afocal telescope magnification ✕ power of the plus lens ÷ 4). total magnification See combined magnification. trade magnification See apparent magnification. transverse magnification See electronic magnification; linear magnification. 4. radiological magnification; a factor of object to film distance. Some didn't even return to the same POI when returning the magnification to the same place. PLANE TALK ON RETICLES: 1ST OR END PLANE ... DOES IT MATTER? These low vision aids work on a principle of using magnification to increase the retinal image size. Fauth usually employed magnifications of only 25x per inch with his 6-, 7-, and 15-inch refractors, reserving the highest magnifications of only 38x per inch only for the finest nights. Surgical magnification can allow the operator to see things that are not distinguishable with the naked eye. Well known salt and pepper noise with single white and black pixels is almost invisible in image, but brings a great distortion during magnification. 000x magnification on a Philips XL40FEG microscope, horizontal field width: 24 micron, 2006. The first thing to understand is exit pupil and relative brightness at a scope's highest available magnification. Outsized objectives: are you getting the full benefit of your large objective riflescope? 7), with its ten reference photographs, has been used when comparing a carbon black filled compound at 30x magnification (see ASTM D2663, Method A). The smaller the focal-spot size, the sharper the image at high geometric magnification. As an open-tube design and manufacturing house, phoenix x-ray holds technology leadership for ultra-high resolution and magnification. Taken at magnifications of 50 and l00X, these pictures illustrated the relationship between the gas bubble, graphite and lustrous carbon. 30 NA lens (although given the popularity of the KAF1400 CCD chip, perhaps it should be), so these optimal magnifications can only serve as a guide for selection of the best objective lens.